Jim was working on two projects. 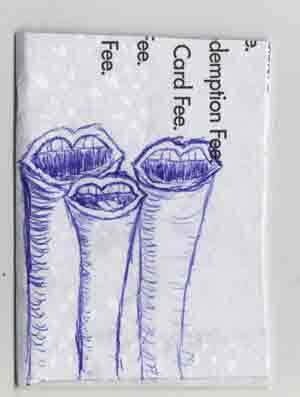 The first one was a pipe organ made of robotic mouths. It was based on a toy that he’d seen as a child which was a musical keyboard where each key made a tone and triggered the release of a puppet character ascribed to the sound. Jim’s organ ascribed a series of robotic mouths to respective keys and stops. Each mouth was able to pronounce vowels but not consonants. The mouths were visible to the audience, whose reaction possibly dipped into the uncanny valley, a place usually reserved for androids. Jim worked on a set of 3 songs for his organ’s debut: Bach’s Toccata and Fugue in D minor and the main themes of Star Wars and Star Trek: The Motion Picture. His debut was a success. People loved his organ and his performance. Word got out and he was asked to play his organ on a semi-popular television program. The excitement inspired him to buy a fitted suit. Looking very sharp, he went on the television show, performed the Bach piece and stood in front of the hosts who also happened to be judges. One of the judges was in a couple of popular bands sometime ago and therefore could not be judged on anything. Jim promptly put his second project on hold.